People do not naturally have conversations with more than 5 people. It is your job to make this possible by amplifying the feedback and cues from other participants. If you are sitting in the middle of the table, people will look to you for cues as to how to behave/ perform / react in the unfamiliar situation of a talk show. If you are uncomfortable, so will they be. If you are disinterested, anxious, embarrassed, so are they. If you are enthusiastic, calm, relaxed or enjoying yourself, well? Sometimes, something will go wrong. The Table may run out of batteries, everyone might get up and leave the table at once, it might start raining. Just keep going. It may seem pointless, but even if you’re just there chatting to one person for an hour, keep going. Eventually, it will pick up again – as long as there is at least one participant around -you just need to keep trying. If you’re comfortable with the thought of sitting in the table talking to one person, then every extra participant is a bonus. It might sound confusing. Different techniques work better in different circumstances. After a few goes you’ll get the hang of it. 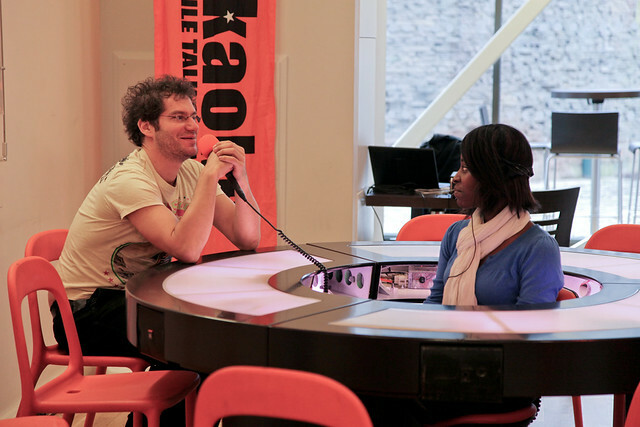 Talkaoke is the sum of you, your team and the audience. If you give it all your energy and it doesn’t work out – don’t worry. You did your best. There are moments when it’s the wrong time to talk. Knowledge of any given subject is always useful for hosting Talkaoke, because you will then know the cleverest, stupid question to ask. However it is not essential. In a community of experts, everybody should be able to explain what they are talking about. If they can’t it’s a very good challenge for them to try and they will certainly learn. In a mixed field this even more important. People are generally reluctant to admit they haven’t a clue what is being said, so you need to ask on their behalf. If you are knowledgeable about a field, it doesn’t mean you need to demonstrate that knowledge; better to let those around the table achieve a consensus on what is factually correct or right. People love to demonstrate what they know to others. That is the participants’ prerogative, not yours. You can still question inaccuracies and misconceptions, but let other participants do the correcting. If you are questioned directly and nobody else around the table knows the answer, then perhaps get someone to consult wikipedia or other online source! Failing these options, it is only then appropriate to come in with your own opinions or facts. Or you might be asked about the process of Talkaoke itself. Warning!- talking about the process of Talkaoke itself generally makes for a very dry conversation. You are not the expert! In fact the opposite. Try not to give facts or correct other people even when you know them to be wrong. That is the privilege of someone else around the table. You can throw a statement out to the audience you think might be dubious, but if nobody corrects it, hey it must be true! Memory is context specific. I’m not sure how I remember people’s names. I kind of spin round and remember the names geographically according to where people are sitting. I often get it wrong. It doesn’t matter. People will forgive you. When we worked with professional commentators, one of the thing I realised is that sometimes they get the name wrong but nobody generally notices. Of course in this case, people will notice but they won’t get offended. If you are relaxed, enjoying yourself, paying attention and truly in the moment, it is much easier to remember names. If you are anxious about doing a good job, or worried whether you are talking about the right subject then it is much harder. It’s good anyway to “do a round of names” just to keep everybody involved. A round of names is an undemanding way to keep those participants who haven’t said anything involved in the discussion. I periodically do a round of names unless the conversation is moving too quickly. If someone forgets what they were going to say, generally they will remember if you “rewind” This involves doing a one sentence recap of each of what the last three people have said. Don’t worry if you have forgotten some things yourself. You are not a tape recorder. You will be surprised how well this reminds people what they were going to say. The “sum up” is a very important skill in Talkaoke. It is used for four things. It involves thinking of the conversation as a series of tabloid headlines. Sometimes there are many themes going around the table and if left unattended these threads will unravel. If you sum up the key points on the table it will add coherence to the conversation. These headlines need not be super accurate. Sometimes I deliberately paraphrase or misquote someone to get a reaction going. It’s more about stimulating people around the table. When you are doing these recaps look at everybody’s faces to see what they are most engaged by. Quite often long-winded people will make a point and then make the same point in a slightly different way and then make an identical statement in a subtlely modified form. You get the picture? What they are actually looking for is affirmation and that’s where you can help. If you sum up their point in as few words as possible and give it some gravitas that will make them feel better. Every now and again you can ask for a round of applause if you need even more response. If you turn the “sum up” into a question it is a good way to invite people to the table, because it saves words, performing at least three functions at once. People want to talk about two totally different subjects !?! As the host you can be forthright about your desire to achieve a consensus in the middle of the table. If you sense the conversation fraying into different threads you are the one who needs to highlight this and either choose a definite strand and sum it in that way, (see above) or ask the audience which direction they would like to take the conversation in. The most creative thing you can do is link the two subjects together. For example if one person wants to talk about depletion of the rainforest, and another person wants to talk about open relationships, maybe your question could be “how does single living contribute to environmental destruction?” or “is there a link between mahogany and monogamy?” Use your imagination. Linking disparate subjects will give you new insights into both. It will take a bit of time to get used to all of these ideas. Aside from listening to people and being the referee, it’s quite different from chairing a debate. Once you get the feel of these skills, have a look at the Tricks of the Trade.